Balance bikes are currently all the rage! They place focus on helping children to find their center of gravity on a bike prior to adding the task of pedaling. Though you will find many products similar in concept on the market today, I'm here to tell you from experience, they are not all created equal in design. We have been vigilantly attempting to teach our daughter to ride a bike sans training wheels for the better part of a year, unfortunately, to no avail. We finally agreed to go the route of the much praised balance bike, with hopes of gradually teaching her to master the act of balancing on a moving bike. While we were aware of the general concept of balance bikes, we were unaware of what features to look for when shopping around. So what were we looking for? Two wheels, on a frame that looked much like a streamline bike(some brands resemble streamline bikes more so than others). We couldn't have been more naive! To have a successful experience, there are essential features to look for in a balance bike (this we now know!) So what should you be looking for? A low center bar with a platform for their feet; which allows children to really attempt the act of balancing while gliding (the whole point of the balance bike). While it is great to "foot pedal" (alternating feet and pushing off to propel) the platform really allows the child to find their center of gravity on a moving bike (without training wheels); giving them the best chance at advancing to the next step of actually pedalling. The KaZAM has it all. They have incorporated all of the essential features into the design of the KaZAM, to ensure your child's success in advancing to a pedal bike. 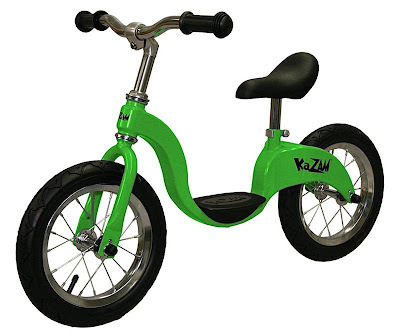 KaZAM balance bikes most resemble streamline bikes in their design and are incredibly sturdy. The KaZAM holds an impressive maximum weight of 75 lbs. (most balance bikes currently available on the market only accommodate 50-60 lbs.) and offers extendable handlebars and an adjustable seat that grows with your child as they are learning to ride. The results thus far are pretty impressive too! After only a week on the KaZAM, we are already seeing a huge improvement in our daughters ability to balance; I'm sure she will be advancing to her pedal bike in no time at all! 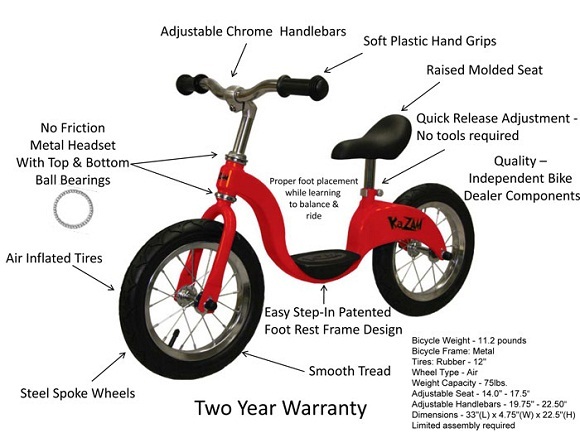 Skip the training wheels and teach kids to balance first using the award-winning KaZAM balance bike! 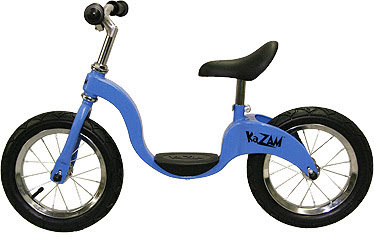 KaZAM is the only run bike on the market uniquely designed with a foot rest. Children lift their feet up naturally and position them on to the foot rest maintaining proper balance and center of gravity similar to riding a traditional bicycle. It is the most realistic approach to learning coordination and balance; and ultimately teaching kids how to ride a pedaled bike. KaZAM is an industry leader in Consumer Product Safety - In compliance with HR4040 - Consumer Product Safety Improvement Act.